I've done a Fall theme week the last 2 years, so I had to do another one this year! Welcome to my Pumpkin Posting Party! It's all pumpkin, all week! I've got a little giveaway for you that I'll share at the end of this post and Wednesday you can come by and link up all your pumpkin posts! Friday will be Dessert Friday with a focus on pumpkin, but you can link up any chocolate, non-chocolate or pumpkin desserts that day! Recently I received a free pumpkin from my friend's garden so I decided to attempt roasting a pumpkin for the first time. There were several different methods posted online, but I ended up going with more of a steaming method. 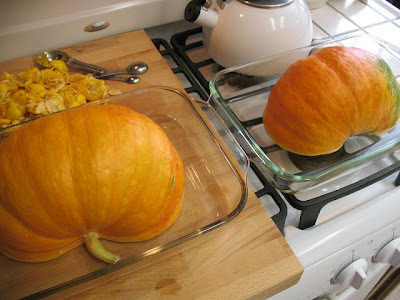 I basically followed the instructions posted at Elana's Pantry on how to roast a pumpkin. Scooped out all the seeds and strings. In pans with water, ready to roast. Scooped out all the good stuff! 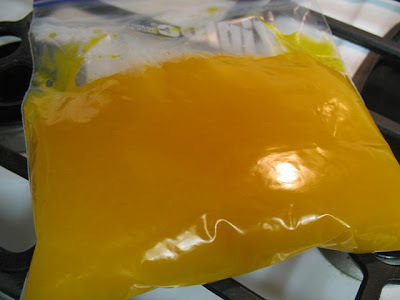 Removed some liquid, whisked into puree, and bagged. 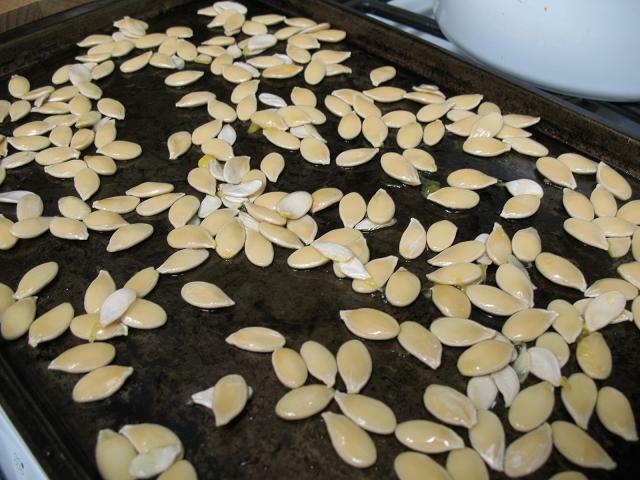 Pumpkin seeds rinsed and cleaned, ready to dry and roast. The pumpkin flesh ended up a little watery with this method, but I preferred that to the thought of it getting too dry. 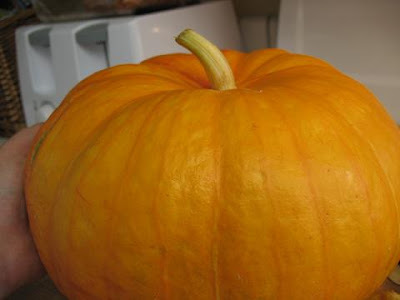 This pumpkin gave me enough puree to equal 2 cans of pumpkin! I put 1 batch into the refrigerator and made pumpkin bread with it (it was delicious with the fresh pumpkin)! 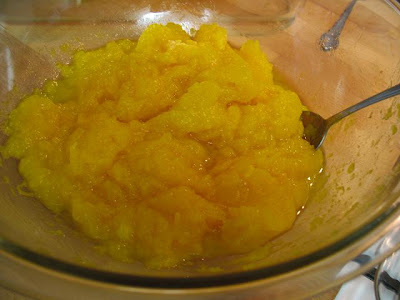 The other batch is in my freezer, waiting for just the right pumpkin recipe! I felt like Elana's method was very easy to follow. I did end up cleaning the pumpkin seeds - it took me so loooooonnngg because I was obsessed with getting every bit of pumpkin off of them. Not an easy task! Once they were dry, I roasted them with some oil and sea salt. They did turn out yummy, but my hubs and son weren't that excited about them. It was such a small amount for the amount of time I spent on them that I wouldn't do it again. Have you ever roasted a pumpkin? 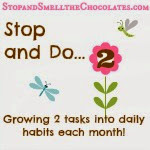 What method do you use? 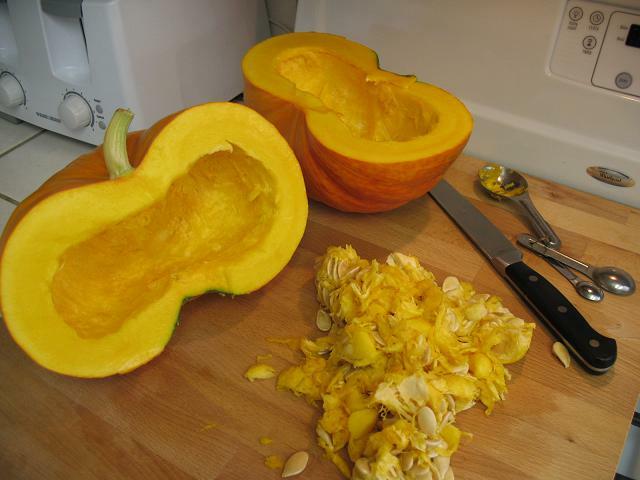 If you've never done it, you've got plenty of time to try before making those special pumpkin recipes for Thanksgiving! 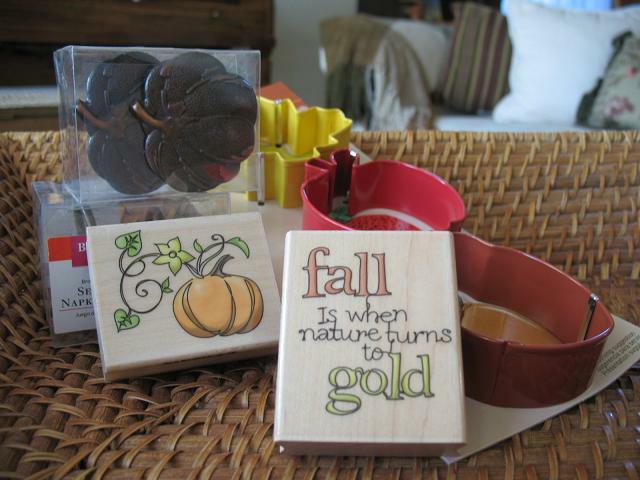 One random commenter from this post will win this little collection of Fall goodies! All you have to do to be entered is to leave a comment on this post - that's it!! I'll pick a winner with random.org and post it next Monday 11/8. Happy Fall! 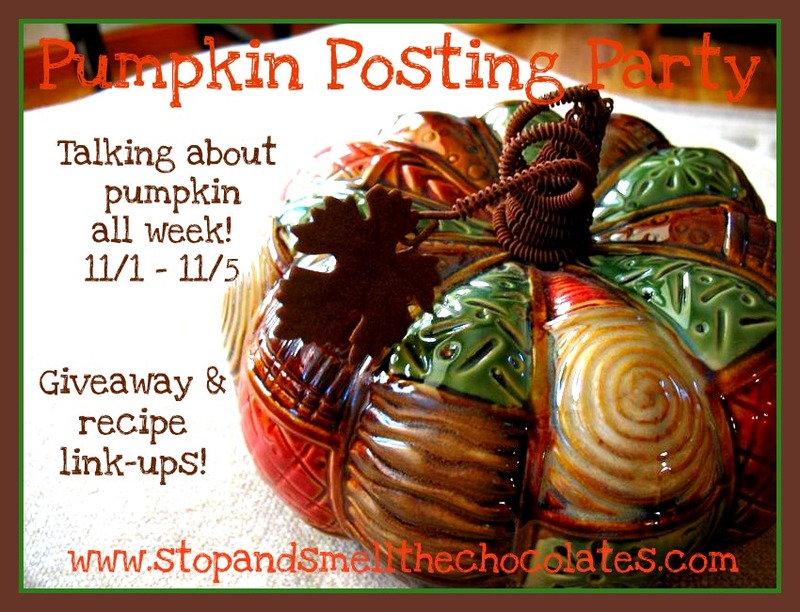 Keep stopping by all week for more pumpkin posts! 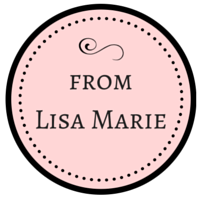 Tomorrow I'll be sharing a yummy pumpkin recipe! 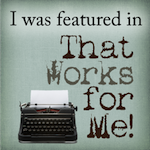 Feel free to grab the button at the top and put it on your blog to share the pumpkin! Have a fabulous Fall day friends!! We just got a pumpkin and I was wondering what to do with it. Now I know. You're always such a great source of info ;) Thanks my friend! Loved your pumpkin post! I usually buy a pumpkin for decoration purposes and end up just throwing it out. I use the canned pumpkin for recipes. I'll have to tell you about the time Kathy and I "roasted" a pumpkin and the conversation that went with it. And I'm sure you won't have any trouble getting people to participate with your week long pumpkinfest! 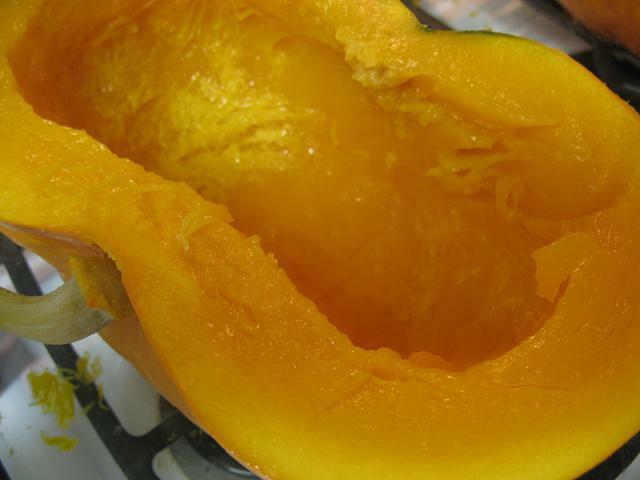 Big eat lots of pumpkin for that natural California glow size hugs to you! I made 2 pumpkin breads the week before last. The one with pecans was so delish! The one with Chai tea is in the freezer (but it will probably come out this week). Great little giveaway. Please add me to your list and I'll cross my fingers. Thanks. My kids Love roasting the seeds. Yum! And I love the shape of the pumpkin you cooked. You knew that recipe would catch my eye, didn't you? LOL.